So I done did the deed. 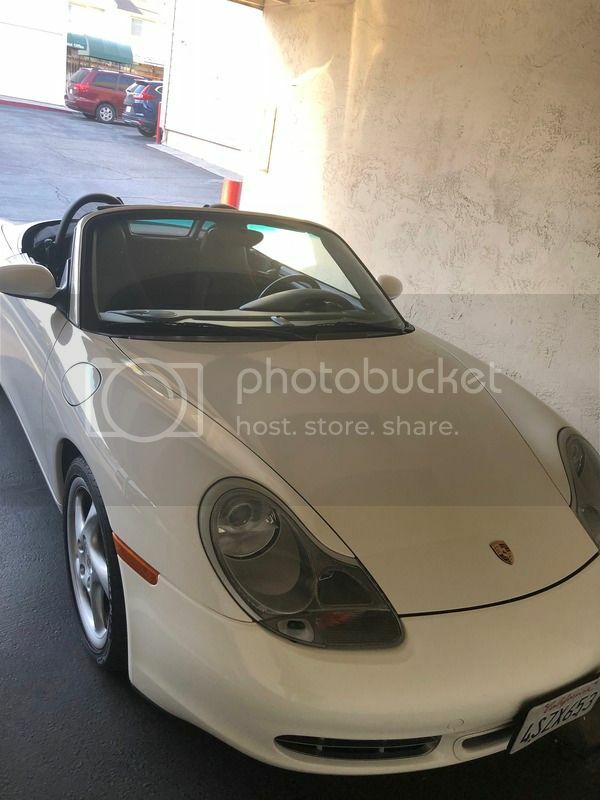 I bought the 2001 Boxster S.
The gentleman was nice enough to bring the car to me. I gave this car a good looking over, and he was definitely confident. I work for a dealership and I have access to the racks, and alignment pit. The car has new Bridgestone Potenza tires. The IMS was replaced during a clutch job before the original failed. The leather is spotless in this car, and it has a new glass rear window top. 80% left on the pads even! It has the rear package self speaker system, but for some reason it is not plugged in. The car has a 1200 watt audio system in it with Pioneer deck that has Nav, etc. The down side... The little screen on the Tach has some funk going on with it, so I need to send that out for repair. The driver side window is an enigma.... Some times it works great, sometimes it gives me the finger and says I will do what I want to do... and you can't stop me. It did fail smog the first try! Two O2 sensor codes popped up on me. But I cleared them... they did not come back.... and the car passed It has a little door ding that I am getting fixed, but other than that the body is flawless! But what I think surprised me the most. The car is immaculate inside and out, looks loved. The lack of maintenance though! The cabin air filter I think was the original! It was PACKED with dirt. The engine air clear was not much better! The car ran completely different after changing it. Looks great! Welcome to the club! I'm digging the white on black. Also, those are good looking headlights. Thank you, I love the white on black as well. And I got super lucky with the headlights not being nasty. Your car looks great! I'm a big fan of white cars. No need to tint the headlamps either. Any decent shop can shoot a coat of clear that will work just fine. Try Amazon also they have amazing prices for periodic maintenance e.g. filters, oil, plugs, etc.